Graduation is one of the biggest events of the year for preschool and kindergarten students, but all that pomp and circumstance doesn’t come cheap. We know you want to give your kids a special and memorable graduation, but how do you do it when money is tight and your budget just isn’t big enough? Here are a few easy ways to add a few extra dollars to your graduation budget. Community support is a key factor in school success, and most businesses love to help out their local schools whenever they can. Recruit parent or staff volunteers to call or visit businesses in the community and ask for monetary donations in exchange for free advertising. You could offer them ad space in your graduation program, print their logo on a special “Sponsors” banner, or even mention them in a special announcement during the ceremony. Parents love to support their children’s schools, but work schedules often make it difficult to contribute time or talent to school causes. Selling custom-imprinted items that feature your school’s logo offers parents a great way to show their support and your school an easy way to raise funds for Graduation. Try things like t-shirts, travel mugs, umbrellas, and even cell-phone chargers. This is a great fundraising idea that does double-duty: It gets families and the community involved in your school AND raises funds for your graduation event. Charge a small fee for carnival tickets and/or BINGO cards and pick up small toys as prizes or ask local businesses for prize donations. 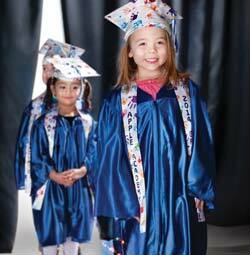 Asking parents to purchase graduation caps and/or gowns for their kids is a great way to help offset the cost of graduation for your school. While some schools prefer to provide these items for their kids, it becomes a a viable option for many schools when they find that parents actually don’t mind buying these items for their kids, as the caps and gowns make wonderful keepsakes of the big event. You CAN give your kids a great graduation ceremony, even when money is tight, with easy budget-boosters like these. 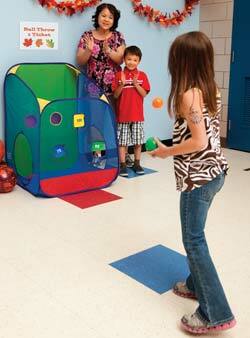 How do you raise money for events at your center? Share with us.